As I don’t only produce one type of learning resource, I thought I’d bring together some of the articles, audio and video resources on effective communication. 1. Are you confusing your readers? You may think you provide good information, but that won’t help you if your message isn’t clear. This is why it’s important to make sure that you’re not confusing your readers. This information is available as a podcast. 2. Are you annoying your readers? Similar to the first article here, your message may be clear, but if it doesn’t come across well, or if you do something that is annoying, people are likely to stop reading or to ignore your message. Listen to more in this podcast episode, or request the pdf from the podcast page. Sometimes it’s not the complicated sentences that cause the problems, but simple errors with dates and times, or phrases that could be easily misunderstood. Make sure that you avoid these by listening to this podcast episode. 4. How can you persuade customers to trust you? Getting people to know and like you is a bit easier, but how do you persuade them to trust you? Here, effective communication is key, and this article talks about some things that you can do. Sometimes it can feel stressful if you know you’ll have to attend a meeting in English, give your opinions, join in the discussion, or share your ideas on a range of topics. In this free webinar recording, you’ll find some tips on how to prepare for such meetings, and things that will help you while you’re there. 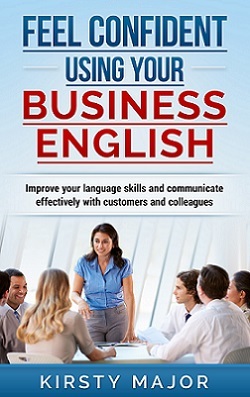 If you want a more in-depth look at improving your business English, you will find 50 different topics in my book, Feel confident using your business English. Further details on my book and where you can buy it can be found on the book page. Technology has changed the way we present information. Our audience is not always in the same room as us because we can now deliver online presentations – either in realtime, such as webinars or Facebook live sessions, or to be watched at a later date. In this article, you’ll find tips on extra things to consider when presenting to an online audience. Whether the presentation is online or in person, you shouldn’t just turn up without doing some planning. If you’re presenting in a language that is not your native language, there are some additional things to consider. Find out what they are in this free five-day audio course. When people have to present information to colleagues, customers or other professionals in their field, they often spend a lot of time looking at their slides and notes, but if there is going to be a question and answer session afterwards, it’s good to think about the types of questions that may be asked, and how you would answer them in English. You can read more about this in this article. Maybe presentations aren’t the problem. You’re happy talking about familiar subjects. The problem comes when you have to chat to people and have spontaneous conversations at networking events. My 10-day audio course on networking will give you some ideas on how to make this easier. Small talk doesn’t become easier when you learn more words. For some people, it feels like a waste of time, even in their own language. However, it’s a necessary part of many business interactions. In this guest post on English with a Twist, I give tips to help people who don’t enjoy small talk. 12. Is your writing style right for your audience? The grammar and the spelling might be fine, but I’ve seen a number of examples where the writing style was not appropriate for the audience, causing a range of problems from confusion to annoyance. This article gives you 10 things to consider.